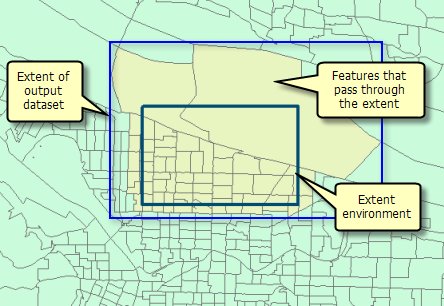 The Extent environment setting defines what features or rasters will be processed by a tool. It is useful when you need to process only a portion of a larger dataset. You can think of this setting as a rectangle used to select input features and rasters for processing. Note that the rectangle is used only to select features, not clip them. The extent of the output dataset will typically be larger than the Extent setting to account for features or cells that pass through the extent rectangle. The extent entered is assumed to be in the coordinate system in which the input data is stored, even if the Output Coordinate System environment is set. If the tool takes multiple input datasets, the first dataset defines the coordinate system of the extent. Default—The tool you are using will determine the processing extent. All tools have a default extent they calculate from their inputs. This default is rarely documented in the tool reference page but is usually obvious. For example, the Intersect tool will only process features that intersect one another, the Union tool processes all features, and the Clip tool will only process features within the extent of the clip features. Union of Inputs—The combined extent of all input data. All features or rasters will be processed. Intersection of Inputs—The extent where all input features or rasters overlap (intersect one another). Note that it is possible that none of the features or cells overlap and that a null extent (zero width and height) may result. In such cases, no features or cells will be processed. As Specified Below—You enter the coordinates of the sides of the rectangle (Left, Right, Top, and Bottom). Same as Display—The extent of the current display will be used. For example, if you are zoomed in to your particular study area, you can use this option to process features that fall within the current display extent. When you first specify the extent to be the same as the display, the extent of the display is read and stored. The next time you examine the Extent setting, it will read As Specified Below. If you subsequently change the extent of the display, the Extent setting is not updated—you will have to reset the Extent environment. Same as layer <name>—All layers are listed, and you can choose one as the extent. Like the Same as Display option, the extent of the layer is read and stored. The next time you examine the Extent setting, it will read As Specified Below. When set, the extent environment property returns an Extent object in Python. An Extent object can be used to define the extent. The extent where all input features or rasters overlap (intersect one another). Note that it is possible that none of the features overlap and that a null extent (zero width and height) may result. In such cases, no features or cells will be processed. The combined extent of all input data. All features or cells will be processed. Space-delimited coordinates that define the extent in the coordinate system in which the input data is stored. Path to a dataset. The extent of the dataset will be used. # Set the extent environment using a keyword. # Set the extent environment using the Extent class. # Set the extent environment using a space-delimited string. arcpy.env.extent = "-107.0 38.0 -104.0 40.0"